Jewish Impact on Greek and Western Philosophy? Is there any evidence that Jewish thought and philosophy had an influence on the Greeks? Then there is the evidence of Jewish impact on many of the other advancements for which the Greeks are renowned, like their alphabet and architecture. Much has been made of the architectural acuity of the Greeks, especially the Greek columns, with the Aeolic and Ionic capitals as examples of Greek creativity. However, there is hardly a mention of the Israelite architects who first incorporated, centuries earlier, the now-famous motif of a pair of scrolls spiraling out from a central triangle into the capital of a column. These facts lead us to the glaring question of why we do not hear more about all this. Why, for example, do historians who rely so heavily on Josephus barely make mention of his account of the Jewish influence on Greek civilization? Is there some truth to what Josephus writes, that this is “because they envied us, or for some other unjustifiable reason”?6 Perhaps. But, for some reason, I get the feeling that there is more to it than just that. Sitting and pondering these thoughts, scanning the titles lining the bookshelves for something that might help, a thought suddenly hits me: I have been going about this all wrong! The answer is not to be found in some book of philosophy, ancient or modern; rather, it is sitting there right in front of me in the form of my Hanukkah candelabrum (the menorah). For isn’t the story of Hanukkah really about a battle between the Greek and Jewish philosophies, with the Jews being victorious? When we walk down the street on an average day, can one not still see the signs of this victory? But perhaps I am getting ahead of myself, and should start from the beginning . . . 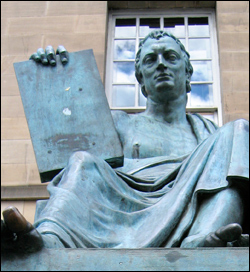 While there were many different, and often opposing, schools of thought in Greek philosophy, what they all had in common was their focus on the role of logic, inquiry and reason, and the supremacy of human intellect. This is not only true of Greek philosophy, but of almost all Western philosophies, which are extensions of Greek philosophy. Even if we would be exaggerating by saying, as Alfred Whitehead did, that “Western philosophy is nothing more than a series of footnotes to Plato,” it is not a stretch to say that as a whole it has been shaped by the Greeks. This brings us back to the story of Hanukkah. At the time of the Hanukkah story, the enlightening Hellenistic culture was spreading throughout civilization. It influenced a large percentage of the Jewish population, and led them to forsake their faith for rationalism, exchanging the supernatural for the natural and the spiritual for the physical. Over two thousand years later, are signs of the triumph of faith not apparent? To be sure, Western civilization and philosophy still thrive. Many still put their faith in reason and the physical. But when we walk down the street, drive a car, or ride the subway, do we not see and hear the expressions of faith and belief all around us? Do we not see the many institutions dedicated to faith and the spiritual rather than the physical? If “Western civilization is but a footnote to Plato,” is it not equally true to say that the aforementioned expressions of faith in G‑d and belief in the spiritual are, in large part, thanks to Judaism and its faith in the One Creator? Please see Why Couldn’t the Jews and Greeks Just Get Along? from our Jewish Holidays site. Josephus, Contra Apionem I:22; Origen, Contra Celsum I:15. See also Porphyry of Tyre, Life of Pythagoras 11. The full paragraph in Josephus reads: “Then [Hermippus] adds after this the following as well: ‘And Pythagoras used to do and say these things imitating and transferring to himself the opinions of the Jews and the Thracians. For that man is in fact said to have transferred to many of the customs of the Jews to his own philosophy.’” While many scholars are very skeptical in attributing the last sentence (“For that man . . .”) to Hermippus, they see no reason to dispute the attribution of the previous sentence (“And Pythagoras used to . . .”) to him, as it matches the approach he takes toward Pythagoras in surviving passages of his biography (Bezalel Bar-Kochva, The Image of the Jews in Greek Literature: The Hellenistic Period, ch. V). Josephus, ibid. ; Clement of Alexandria, The Stromata, Book I, ch. 15. Regardless of whether this incident took place, the fact that a student of Aristotle would write this is an indication of what his impressions of the Jews were. It is interesting to note that one of the aims of Clearchus’ work, On Sleep, of which only fragments have survived and from which the above quotation is taken, was to show that Aristotle himself believed in the immortality of the soul—i.e., that the body and soul are separable, and the soul lives on after death, as was the opinion of Aristotle’s teacher Plato—a view that the other students of his vehemently claim he abandoned. See Hans Lewy, “Aristotle and the Jewish Sage According to Clearchus of Soli,” The Harvard Theological Review, Vol. 31, No. 3 (1938), pp. 205–235. The meaning and ramifications of these quotes, as well as the degree of credence given to them, are matters of considerable debate between scholars. However, since the point of this article is about Jewish impact on Western thought in general (beyond the impact on any one specific person or philosophy), their purpose here is to draw attention to them and to the fact that these discussions do exist. It is for this reason that none of the other myths and legends of Greek philosophers having met, or learned from, Jewish sages are cited in this article. Yohanan Aharoni, Archaeology of the Land of Israel, trans. A. F. Rainey (Westminster Press, 1982), p. 215. Samuel Kurinsky, The Eighth Day—The Hidden History of the Jewish Contribution to Civilization; Joseph Naveh, The Origin of the Greek Alphabet. Are the Ten Lost Tribes of Israel Ever Coming Back? I'm a Christian and currently reading the Church Fathers. They make a case that the Greek Philosophers were heavily influenced by Moses, the prophets, and leading Jewish rabbis of the day. At first, the idea seemed far-fetched, but I think there is actually a good case to be made here. I read an article on the heavenly temple as a form of the earthly temple, which is a symbol or representation of the former. Many of the prophets spoke in terms similar to Plato regarding form and substance, type and archetype. Jews and Greeks God is constant while humans are variables. This subject is not simple. I do not have enough space to explain the whole thing. However, they got together on a human level when they both spoke Aramaic. Their alphabets were impacted by the Summerians and Phoenicians. This story involves a long term parallel effort in which Christians emerged!!!!! No text can be dated earlier than external testimony permits. Genesis, in particular its first two chapters, cannot be dated any earlier than when we find other texts making reference to them. It is not till the time of the New Testament and the Pseudepigrapha from the Hellenistic period, that we have evidence for the knowledge of major figures from Genesis 2 to 4. Plato taught that there had been destruction in the past, many (not quite universal) floods and “fire” endings and beginnings. The Greek Noah, Deucalion, was the hero of one of these floods, sent forth by the cloud gatherer Zeus to punish humans for being sinful. Zeus would also breathe life into the first humans, but this account is pre-religious being myth. Josephus/Rambam - Who Influenced Whom In Josephus' major work, he mentions a man called 'Jesus' who goes by the name of 'Krystos' as well. He used the Greek name for "anointed one". On the other hand, the Ramban used the highest form of human logic (Greek logic) to prove that there is ONE and UNIQUE entity known as HaShem. He managed to do this without infusing Judaism with Greek religious concepts and ideas while at the same time influencing all of mankind. Both men have their place in history now and forever. The Rabbi writes: "While there were many different, and often opposing, schools of thought in Greek philosophy, what they all had in common was their focus on the role of logic, inquiry and reason, and the supremacy of human intellect". Nothing can be added to that. Obviously we have gone backwards. To believe in revelation, in a God, that reveals himself and gives us the rules to live by is seductive, finally everything is figured out, no need to figure out the universe, the World, etc., by ourselves. This is why Jews did not develop any of the things develop. The Greeks basically thought of everything because the liberated themselves from the magical answers, at least the "thinking classes". Judaism, Christianity, etc prevail but not because they are better ideas, just more seductive. interesting comment above It would be fascinating to find such a list, but I have read that the library in Alexandria is gone, as it was burned to the ground. There is a mythic, perhaps romantic idea, expressed in Joyce's book Ulysses, that all the books that were, are and will be, are in the mythic Library of Alexandria, which does exist on some other "plane" of existence. Maybe this is pure fantasy, but I want to believe it, as I see a greater Hand in all of our stories, and so, somewhere, it's recorded, both past and present, and nothing we loved or have loved, is lost. Not our writings that were burned by the Nazis, not those whose words are about love through the ages, and nothing of value, that is about ethics, or works. I am a romantic at heart, but I think it's important to think this way. This discussion could use more verified facts I teach students in philosophy, ethics 107 in a community college, based on my master degrees in Philosophy and theology and my law degree from 1969 through 1975. Mysticism, Psychosis vs Rationalism One of the ideas I am working with is the Talmudic 'story' of the Sanhedrin's decision to excommunicate R. Eliezer: this decision banned mysticism from religious interpretation of the law. It began the tension between supernaturalism vs.rationalism. I feel that this debate was extremely pivotal and has profoundly impacted western civilization: materialism/reductionism/science; haskalah vs assimilation, ashkenazi rationalism vs sephardi mysticism, (BeSHt) vs misnagdim. Was this decision made as a response to off-shoot movements during the Roman conflicts to strengthen normative Judaism? Prophecy, auditory/visual hallucinations, channeling, are problematic in the context of personal truth. Moses and other prophets had private divine experiences not corroborated by communal experience as at Sinai. Supernatural, Mysticism, Psychosis vs Rationalism I should preface this by explaining that, within my family, there are both: one brother who is a clinically diagnosed psychotic auditory hallucinator (schizophrenic), and 2 brothers who are apparently 'normal' except for the fact that they communicate with a non-physical being who tells them an interesting, but ultimately depression-producing 'cosmology', as well as having the ability to perform psychic healing and communication. The Chabad interpretation recognizes many worlds, shades of physicality, including angels and other beings that HaShem has created, yet says we need to be focusing here on this lowest of planes- Earth- making it livable for the Highest. the Greek Pantheon of Gods I find it interesting to think about this question of gods and goddesses, and where all the Greek stories came from. They are so detailed, and when I look at them, I see they do describe aspects of us all, as incorporated in these fantastic tales, that are truly amoral, being not about ethics, but they are, about people. I have taught this subject, and there are books written about the metaphoric and psychoanalytic connects to our lives. I taught this, too. We have One G-d, and yet One G-d of many qualities in the One. They had many gods, and all these gods incorporated different qualities of what we could reference as the One. I think this is a story of the evolution of the One from the Many. And in fact, we are all of us One, and yet, diverse, an essential paradox. We have boundaries and yet under a microscope we all become molecular soup.